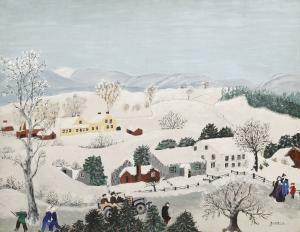 Find artworks, auction results, sale prices and pictures of Grandma Moses at auctions worldwide. 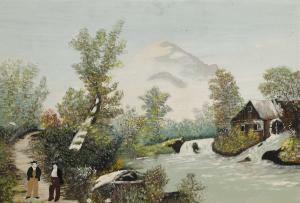 Grandma Moses OUR OLD SAW MILL 1860 - 1961 signedMOSES.lower right; also datedMarch 1950, numbered M1398and titledOur Old Saw Millon an original Grandma Moses label affixed to the reverse (copyright reserved to Grandma Moses Properties, New York) oil, tempera andpencil onMasonite 16 by 19 in. 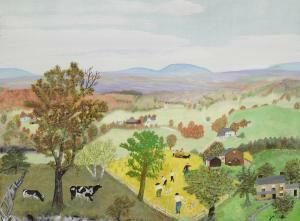 ; (40.6 by 48.3 cm) Provenance Maxwell Galleries, Ltd., San Francisco, California; Eleanore Fleming. 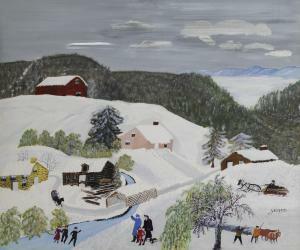 Literature Otto Kallir,Grandma Moses, (New York:H.N. Abrams. 1973), p. 307, no. 905. 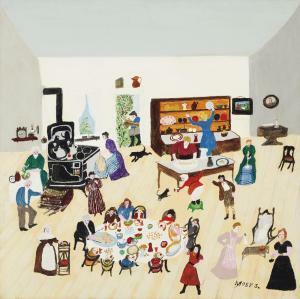 Anna Mary Robertson 'Grandma' Moses (1860-1961) Thanksgiving signed 'Moses.' (lower right)--dated 'July. 6. 1956.' and inscribed with title and number '1725' (on a label affixed to the reverse) oil on masonite 18 x 18 in. (45.7 x 45.7 cm.) Painted in 1956. Provenance The artist. Galerie St. Etienne, New York, acquired from the above. [With]Hammer Galleries, New York. Franklyn Moffitt, acquired from the above, 1971. Private collection, by descent. [With]Galerie St. Etienne, New York. Acquired by the late owner from the above, 1996.